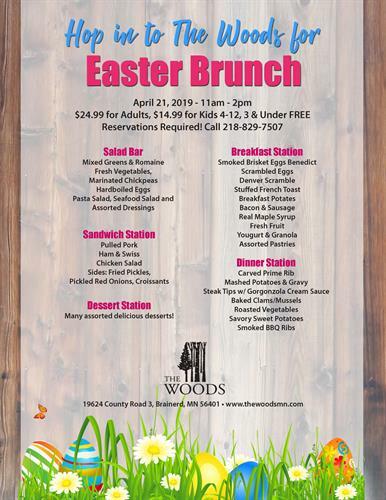 Celebrate Easter this year with a buffet or brunch in the Brainerd Lakes Area. 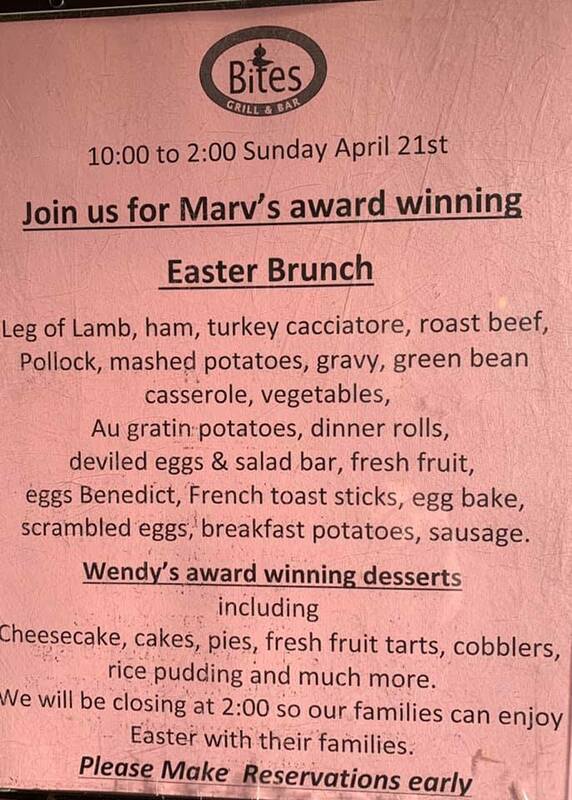 Many of the area resorts and restaurants host a special meal for Easter including bunches and all you can eat buffets. Staying for the whole weekend? 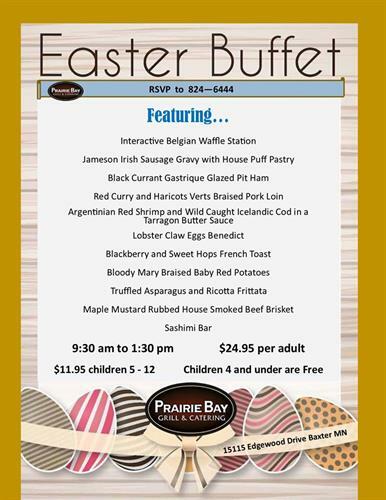 Check for special Easter deals and packages at the Brainerd resorts. The Brainerd Events Calendar will let you know about the great family events in the area for Easter weekend. Annual events include the city egg hunt at Gregory Park. 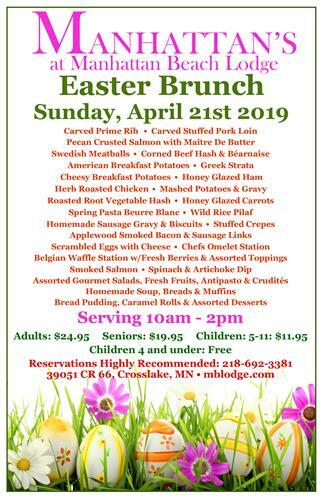 Whatever you decided, there's nowhere better to spend this Easter than in the Brainerd Lakes Area. 10:00am - 11:00am - Be at the center circle in Gregory Park by 9:45 a.m. no later! The Easter Bunny will be there for hugs and pictures! Please bring your own bag or basket to collect eggs! 10:00am - 2:00pm - Hop on over to Easter in the Garden! It’s become an Easter family tradition with live animals, Easter egg hunts going all day, kid’s activities, live music and more! 10:00am - 2:00pm - Come enjoy and shop another Market at the historic Northern Pacific Center – Easter themed with an egg hunt for the kids! 10:00am - 12:00pm - Bring your kiddos to ECFE on Saturday, April 20th from 10-Noon to make crafts, play games, decorate cookies, have their little faces painted and have photos taken with live bunnies! 10:00am - 5:00pm - Come to the Westgate Mall to get your pictures taken with the Easter Bunny! 9:00am - 11:00am - Hunt will begin at 10:00AM sharp, so be there by 9:45. While the hunt is outside, you will be inside until 10:00. There will be a craft to make, cookies and coffee, and photo's with the Easter bunny! 12:00pm - 4:00pm - Join the Pine Center Sportsmen’s Club for our Easter Egg hunt. Registration will begin at 12:00 and the hunt will start at 1:00 with the youngest children first. Adults will have the chance to hunt in the big field. 10:00am - 11:00am - Hunt Easter eggs and celegrate the event with other kids from age 12 and under! Hunt will take place in Forbes Park in Pine River beginning at 10:00am sharp! Bring your basket or bag and enjoy the fun! Sponsered by the Pine River Area Faith Community! Free! 11:00am - 12:00pm - The Friends of Linden Hill will host the first annual Community Egg Hunt on Saturday, April 20th at 11:00am sharp on the upper grounds. Area businesses are donating over 10,000 treat-filled eggs that will be hidden throughout the Linden Hill estate. 11:00am - 12:00pm - The annual Easter egg hunt sponsored by the Pierz Lions Club takes place on Saturday, April 20 at 11 a.m. sharp on the Pioneer Elementary School playgrounds in Pierz.To give everybody a chance to find some of the candy-filled plastic eggs, children will be divided into three age groups: ages 0 - 3, 4 - 6 and 7 - 10. 1:00pm - 2:00pm - Our Staples campus is hosting its annual FREE Community Egg Hunt for children 10 years and younger. Make sure to be there on time – it starts at 1pm sharp. There will be free photos with the bunny as well. 2:00pm - 3:00pm - All dogs must be on a leash during the “tennis ball hunt”. The hunt will start at 2 p.m. and conclude at 3 p.m. Tennis balls will be scattered through out Buster Park as well as around the Boom Lake Trail. Offerings include Fresh Atlantic Salmon, Deep Fried Shrimp, Pepper Steak, plus all your breakfast favorites. Breakfast Station, Salad Bar Station, Sandwich Station, Dinner Station and many assorted desserts! 3 Days, 2 Nights of Easter Fun for $270! Create a family tradition of old-fashioned Easter fun, togetherness and holiday magic in this special spring vacation package. Sunday Easter breakfast buffet and pictures with the Easter Bunny.